In the late 1950s, there were all kinds of low-production shoddy-built sports racing cars available for the average sportsman to purchase and set immediately to the race track. 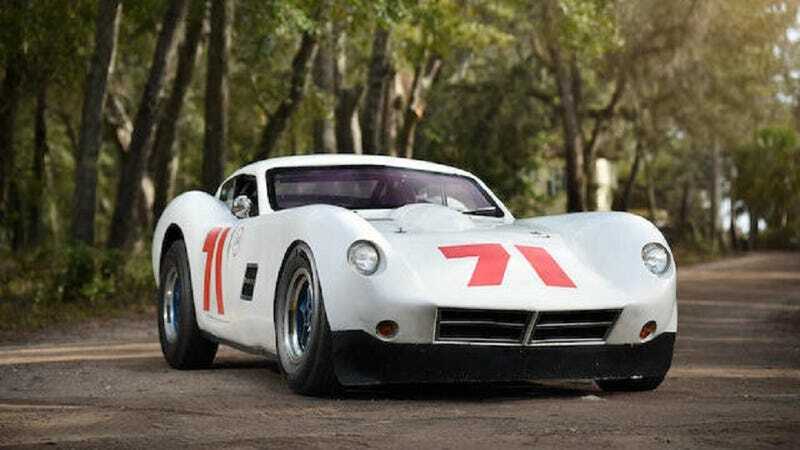 The Kellison J4-R you see here is perhaps one of the better ones, fitting a lightweight chassis with Chevrolet’s venerable small-block V8 and a fiberglass body structure. Only about 500 Kellison J4 coupes were sold, and of those only few dozen were of the R persuasion. Many Kellisons were pushed into service as drag racing machines. Much like the Corvette that preceded it, and the Cobra that came after, the combination of big power and light weight made for an excellent straight line machine. Jim Kellison returned from the war, where he was an attack pilot, and wanted something that would rekindle the exhilarating feeling that flying helos had. Like many other GIs, Jim turned his affection toward sports cars. It’s not quite the same feeling as being shot at, but it’s certainly a healthier approach. The car shown here is chassis 3970020, which was sold initially to Don Rodimer, who had been recently appointed Executive Director of the Sports Car Club of America (SCCA). He owned, and raced this car through his death in 1985. It then passed on to another SCCA executive, Mr. Rich Taylor. Taylor then took the car for a complete rebuild, including a newly redesigned chassis with modern materials and techniques. The car now features four wheel independent suspension and four wheel disc brakes. The safety systems were updated, including a NASCAR-style fuel cell. And finally, the engine was enlarged to its current 406 cubic inches, said to produce a dyno-proven 497hp at the flywheel, and 463 ft/lbs of torque at 4500 rpm. Those are pretty impressive numbers for a car from the 1950s. The car now competes in SVRA events with a full logbook, and has been converted to street-legal use, as the current owner added lights, turn signals, and windshield wipers, so it could be entered in on-road vintage rally tour events. If this Kellison sounds like your flavor of American V8 fun, you can see it cross the auction block next month (March 8th) at the Bonhams Amelia Island collector car auction. With a pre-auction estimate of $35,000 - 55,000, this car actually seems like a bargain, and could be just the updated vintage racer you’re looking to add to your fleet. With all of these new bits, this is likely to be the fastest Kellison out there. Buy it and see. 1958 Kellison J4-R Road-Ready Vintage Racer for $42,500!